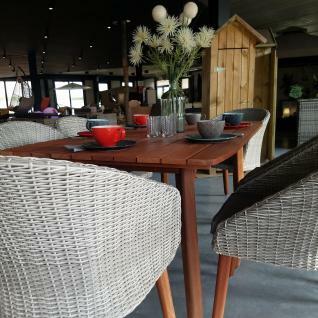 Wood and rounded poly rattan garden set - Huesca - Scandinavian design rectangular 160cm table, 2 armchairs and 4 chairs made from a pre-oiled FSC eucalyptus. Pre-oiled hardwood from FSC-certified forests! 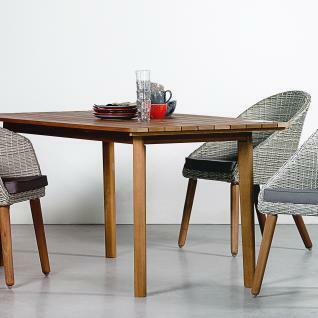 With its blend of rounded poly rattan and exotic wood, the Huesca garden set is both original and modern. The set comprises of a 160cm table, 4 chairs and 2 armchairs. This chic garden set will look just as good indoors as in a garden. 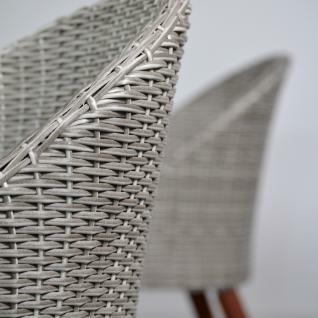 Rounded poly rattan adds an authentic touch that is hard to get from a flat rattan weave. 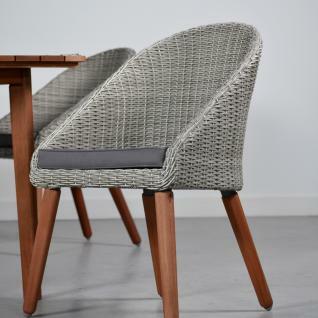 It looks just like standard rattan, but without the inconveniences! 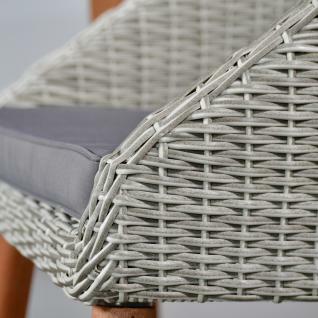 Alice's Garden only uses quality materials when it comes to our woven products. This combination of materials also means the Huesca set is extremely long-lasting! The rounded poly rattan used in this Alice's Garden set will withstand sunshine and poor weather (snow/rain/saltwater). The table and chairs' feet are made from eucalyptus. This is a hard, resistant wood. The wood used is sourced from FSC-certified plantations in Uruguay. It's coated with a colourless oil that protects it while leaving a natural-looking hue. Once this Uruguayan eucalyptus has been chopped, it's left to dry before being sanded down and treated with a protective oil. Its assembled using tongue and groove joints and galvanised hardware. This FSC wood product has been manufactured in an environmentally friendly way and guarantees sustainable forest management. It's important to prepare your eucalyptus garden furniture for winter months. Store it in a cool, dry, well-ventilated place. If you protect it with a cover, choose a polyester one rather than a PVC one. - Keep your garden sofa set away from direct or excessive heat.